FT801 is an innovative system combining 3 features: LCD graphics display controller, touch panel capacitance controller and simple audio controller. It constitutes a development of the FT800 unit while maintaining compatibility with the predecessor. It controls the display of max. resolution 512x512 pixels (QVGA, VQVGA, HVGA) and colour depth of 262k (RGB 6x6x6). As a capacitance controller for touch panels, it simultaneously provides 5 touch detection points and gesture recognition. Communication with any microcontroller is carried out by the serial interface SPI/I2C, which is optimized for object-oriented programming. 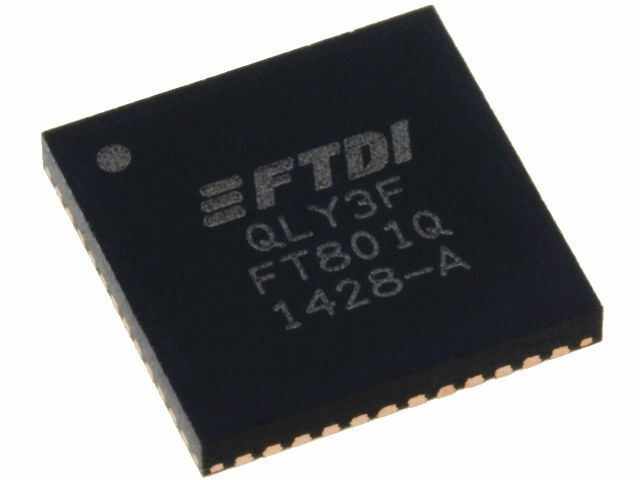 It is available in a compact housing - QFN48.